I received from my partner day before yesterday. When I get home from work tonight I will finally have the computer to myself to post photos of the lovely package! Thank you Kansas96! I received a package stuffed full of good stuff from Lindy earlier this week. Seriously, she sent a ton of fun and delicious extras! It made me smile when I saw how many of the same types of things we sent each other. The funny thing is that before I chose the design that ended up on Lindy's stocking, I too was playing around with the idea of adding snowflakes and actually created a mockup before choosing a different design . I have already opened up and enjoyed some of the chocolate and I can't wait to have a cup of minty hot chocolate! The socks are tall and perfect for wearing with boots! 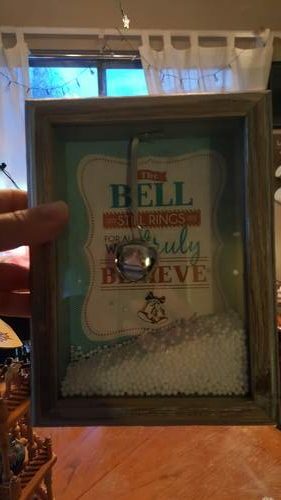 The little snowman under the Joy ornament is a pin and the snowmen at the bottom of the pic are salt and pepper shakers. I love how little items like that can add instant festiveness! We both made each other shirts with heat transfer vinyl . This was the first thing I took a picture of so I could wear it right after I opened my package! Lindy also made my son a fun coloring shirt and sent along a stocking for him to color as well! Lindy, this is such a fun activity, it's something that will appeal to kids of all ages, you should definitely make more of these! She also sent a personalized goody bag full of fun things for him to enjoy! It includes a paint your own tic tac toe set, a suncatcher & shrinky dinks to color, along with a tasty looking candy cane! Next up is some jewelry! She sent a matching snowflake necklace and bracelet set. I love the sparkle of the crystal part of the necklace! Look at how cute the little tree in a jar is! 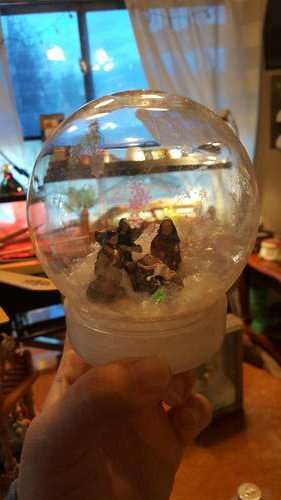 She completed it with snow in the form of iridescent glitter! We both sent each other handmade ornaments and the funny thing is that we each sent a glitter filled ornament complete with a vinyl design . We also both sent each other garland. She sent this super cute red and white ball garland, which was ideal for my son's play house! The house looked cute with just the lights, but the garland elevated it to a whole new level of festive cuteness! Lindy and I both made each other soy candles. It turns out we're both new to candlemaking. It made me smile that we both opted to try our hands at the same new craft to send to each other. The dashing through the snow is the perfect size for the top of my hutch. Lastly, is a cute embroidered cardinal hoop. 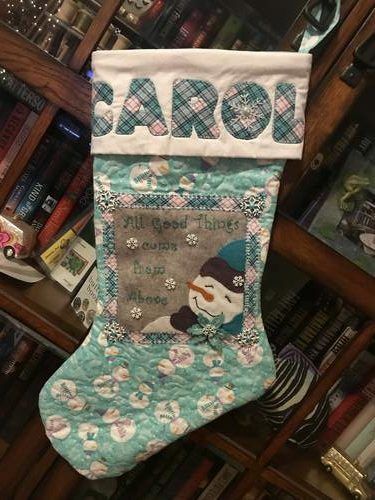 I have to admit, when I saw that Lindy and I were partners, I was hoping I'd receive one of her fabulous embroidery creations and she did not disappoint! Thank you so much, Lindy!! I really enjoyed being your partner and I appreciate everything you sent! Yay!!! I’m so glad you like everything!! We were paired perfectly! I wore the shirt you made me to my family’s annual cookie exchange last week. Quickly reading the posts need to make some comments as there are so many great things being sent in these stockings! Here are a few photos of the one I sent to carol. 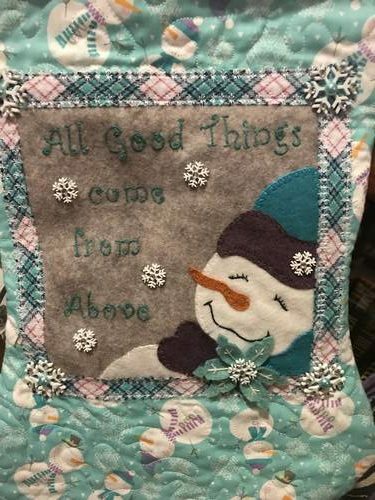 The snowman square is hand sewn wool felt. And some homemade items, some baubles, a cute sign, some crocheted angels and a lovely scarf, along with some yarn. 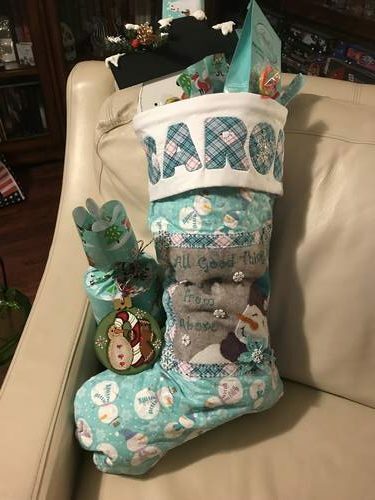 Ok, I received from Homerof2 last weekend, and absolutely love the stocking and stuffers!! And the fact everything was so thinly packed (vacuum packed??) so it went through the letterbox ok and I didn't need to go to.the mail collection office!! She also included 2 small packages for my twins - they'll be opening them today or tomorrow (behaviour didn't warrant a present yet... ). 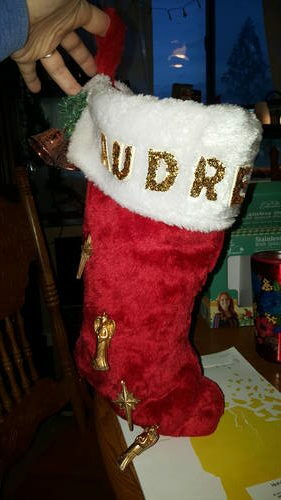 First of all... my LoTR stocking! Paperclips... in different shapes... the paper crafter in me totally squee'd when I saw them!! 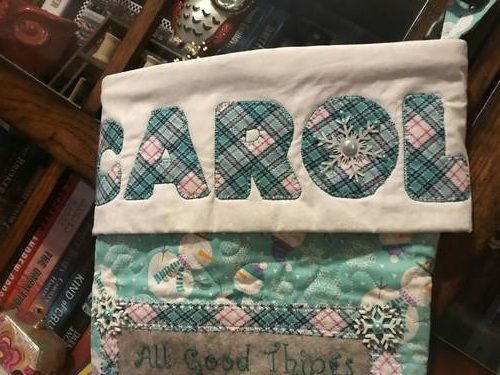 She also included some (Project Life?) cards for pocket scrapbooking (the pack with the butterfly in the previous picture). A handmade tree ornament - Infinity War poster printed on it... (I really have to try printing onto fabric myself at some point in 2019!!). LOVE it!! And a tree tree ornament! LOOOVE! Thank you sooo much, homerof2!! And I'll post a picture of what's in the 2 small packets once I deemed the twins' behaviour worthy to open them! So happy you like everything. I did vacuum pack it . Hubby purchased a vacuum sealer for his homemade sausage and I thought it would help to keep things safe and small. WOW all the stocking and goodies are amazing! Love all the themes and sooo much talent in so many different areas, I am always blown away with this swap. Yes work is flat crazy right now. Is the first moment I have had to pop on and take a look in a good long while. Sorry I didnt a better image of the stocking up thanks for doing that partner!!!! I had planned to do that, but with work, if I manage to eat something eat day I am doing good. Thank you all for once again lightening my soul and given me my balance with this swap. I needed it. 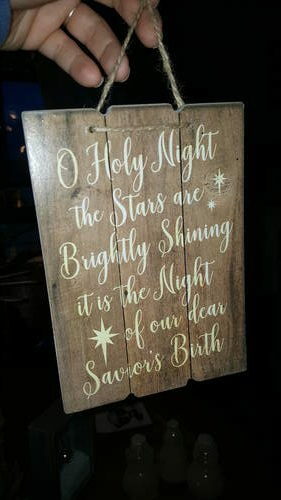 Wishing you all a Merry Chiristmas and a bright and amazing new year.